Hi all! Here's my card for the YNS Fun Friday challenge (I used the inspiration photo) and the Sister Act Card Challenge. I created a quilted look for the background based on the recent Curtain Call Cozy Quilt challenge (which I just missed). This sweet girl is a YNS digi called Tobi Watering Roses. I colored her with copics then cut her out using my circle STAX. The cool background was made using the Fishnet Cover-up. I left most of the jellybean green card stock in place, then popped out some of the pieces and replaced them with various pieces of designer paper for the 'quilted' look. The easiest way I found to do this was by gluing the jellybean card stock and pieces I wanted to stay in place to a thin piece of copy paper. Then I adhered the designer paper one by one until I filled up all the spots I had left open. I used a mini rolled rose and a bit of leafy flourish to mimic the roses in the image. The sentiment is from an MFT set. A little bling adds the finishing details. Hi all! 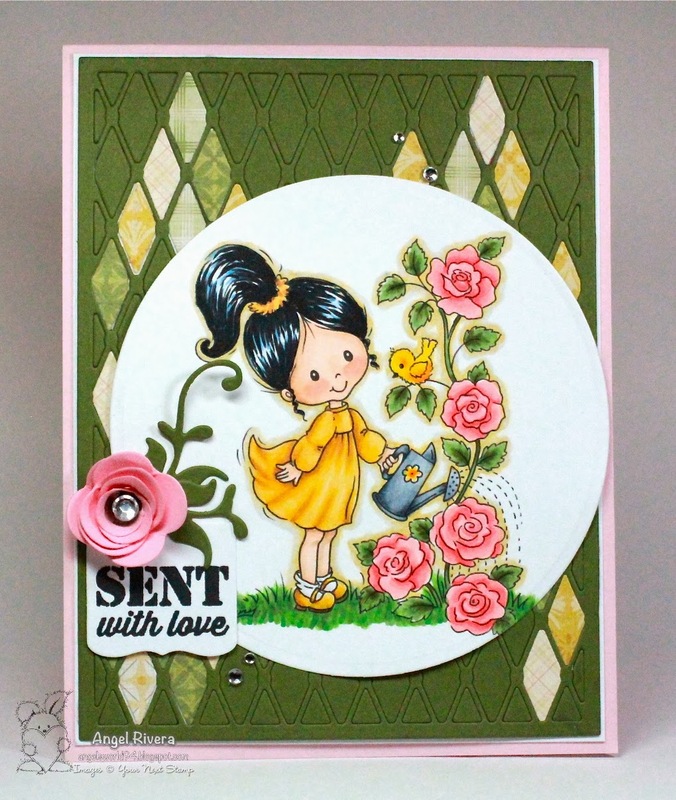 Here's my card for last week's MFTWSC162 using the MPD Contemporary Roses set. I couldn't pass up this awesome sketch! I used lemon drop and cotton candy and razzle berry inks. For the yellow roses, I inked up the larger image then used the stamping off technique, then stamped the smaller outline image fully inked so that it was darker. I used my beloved pierced circle STAX to cut out the image. I stamped "Hello" from the same set onto vellum and attached it with brads. I also used my fishtail flag STAX and square STAX. You know what makes me happy? Having cardstock handy that perfectly matches my designer paper! In this case, jellybean green was my match made in heaven, lol! A little piercing and some hemp thread add the finishing details. Hi all! 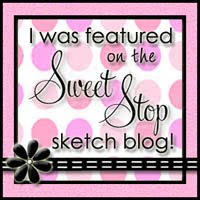 Here's my take on this week's MFTWSC163 sketch using NEW MFT yumminess!!! The card base and striped layer are grout gray cardstock. I used grout gray ink for the DC Striped Backgrounds layer, which is popped up. I cut out the nightshift blue panel with the larger piece from the Smart Phone die-namics, which is also where the super cute "Hello" is from - oh, how I love these die-namics and can't WAIT to use them again! The tangy orange flower is from the Blueprints 12 die-namics. Lovin' that corrugated flower center ;) No flower is complete without a little leafy flourish, right? The flourish and stitched strip (from Blueprints 1) were cut out of steel grey cardstock. 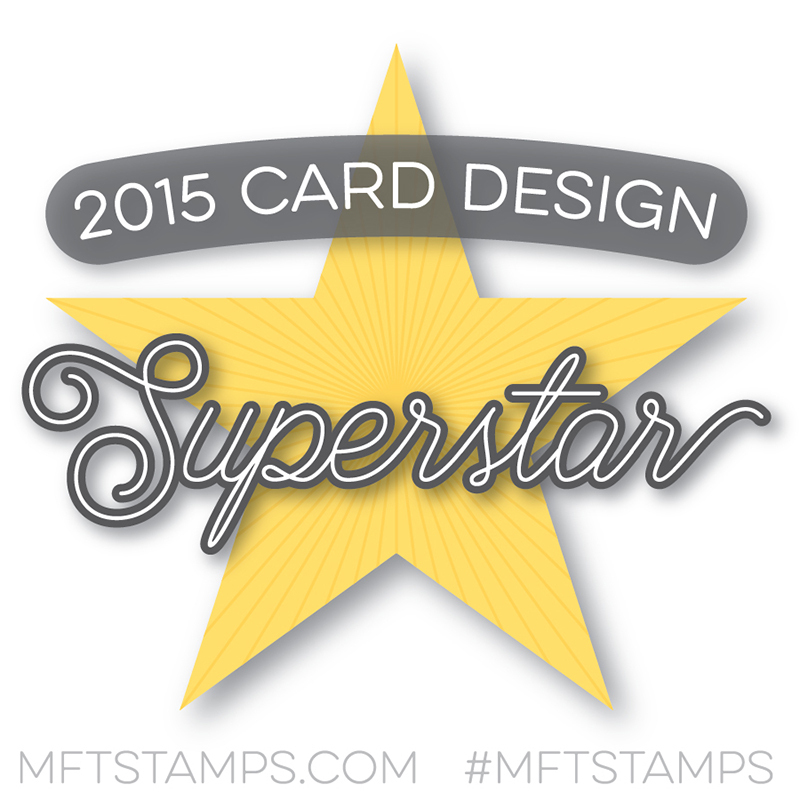 I just realized that the only stamping on this card are the stripes! 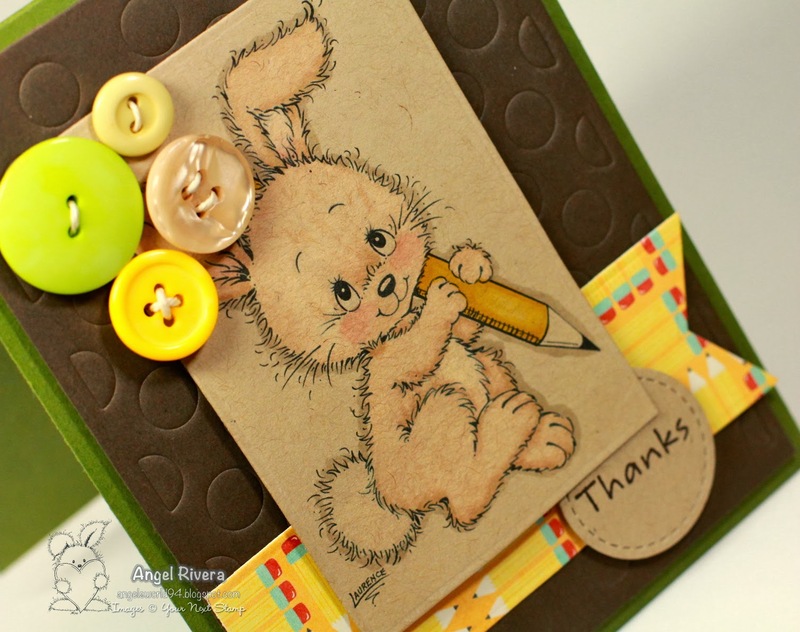 So easy to make a great card using MFT die-namics! A few enamel dots finish out the details. Hi all and Happy Valentine's Day! Here's my take on this month's YNS Fun Friday sketch!!! I also made this for the anything goes challenge on the SACC blog! This sweet digi is Gretchen Loves Roses. I colored her with copics, added freckles with an SU marker, then using my pierced circle STAX to cut her out. 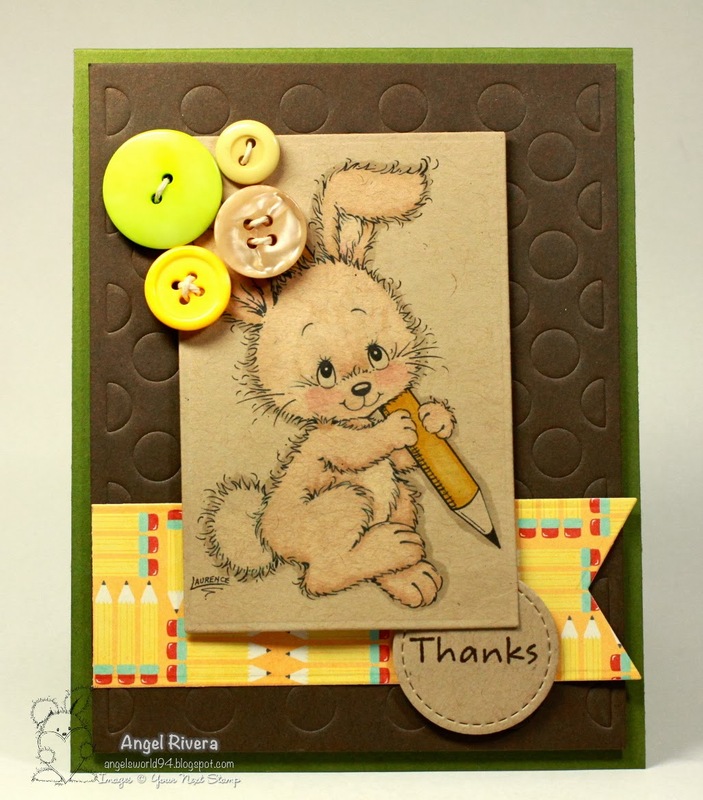 The sentiment is from an MFT Doodle Garden set. All of the matting was done with MFT's chocolate cardstock. Thanks so much for stopping by! 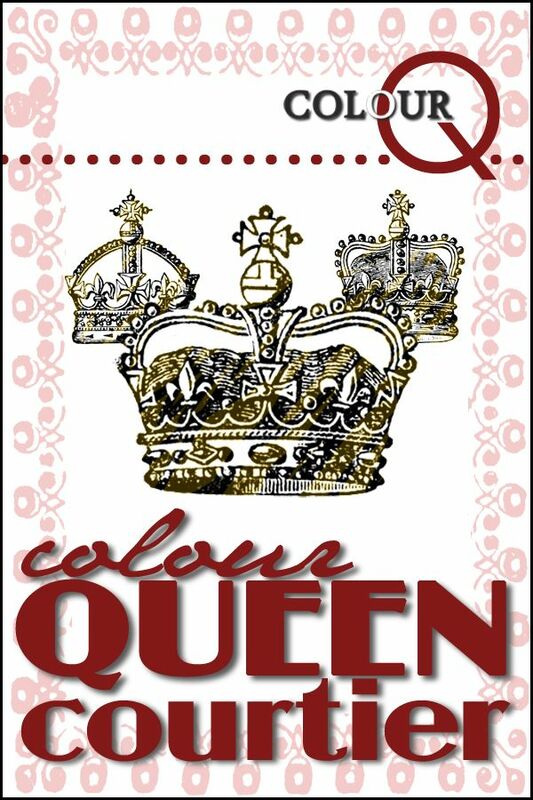 I hope you'll play along for a chance to WIN! 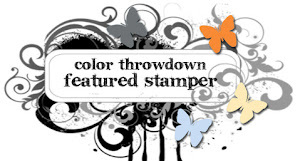 Your Next Stamp - Fun Friday and SACC Anything Goes! Hi all! 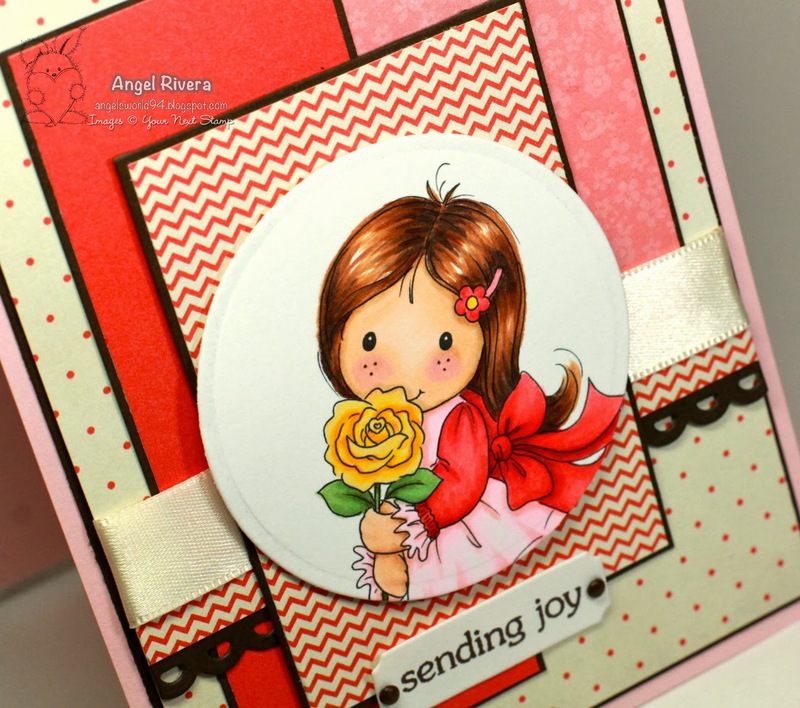 Here's my card using the new February challenge inspiration pic on the YNS Blog! 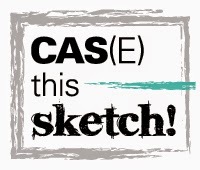 This is also for the anything goes challenge over on the SACC blog - and we're having a DT call so check it out! This sweet bunny is a newly release digi called Just to Say. I printed him on MFT kraft cardstock and lightly colored with copics and bleach (using my aquapainter). I love how he turned out! ;) The sentiment is from an MFT PI set. I also used a few die-namics and buttons to add the finishing details. 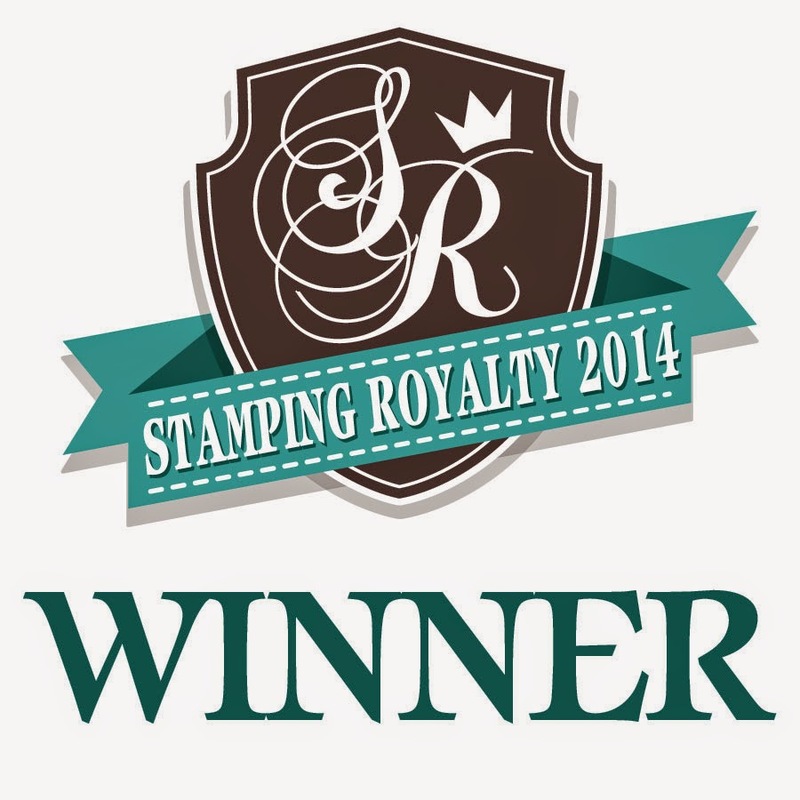 Your Next Stamp Digital New Release! 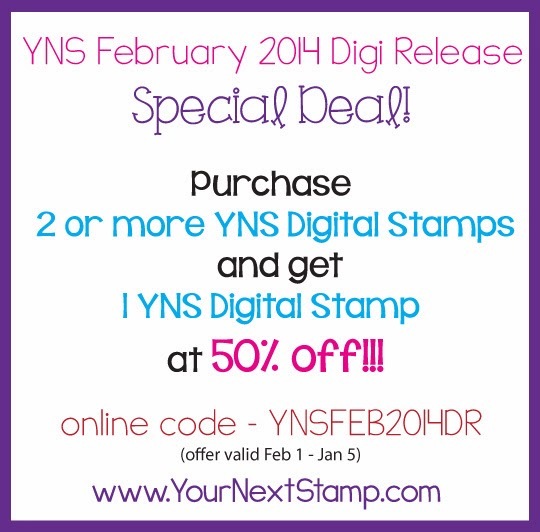 Welcome to the February YNS Digital New Release! 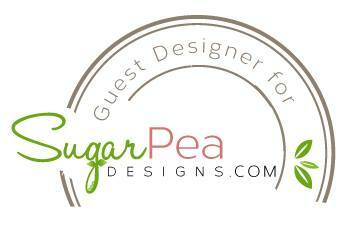 We are so happy to have you join us as we showcase our new images from Penny and Laurence of Omnia Designs!! The party begins on Deborah’s Blog and guess what?! 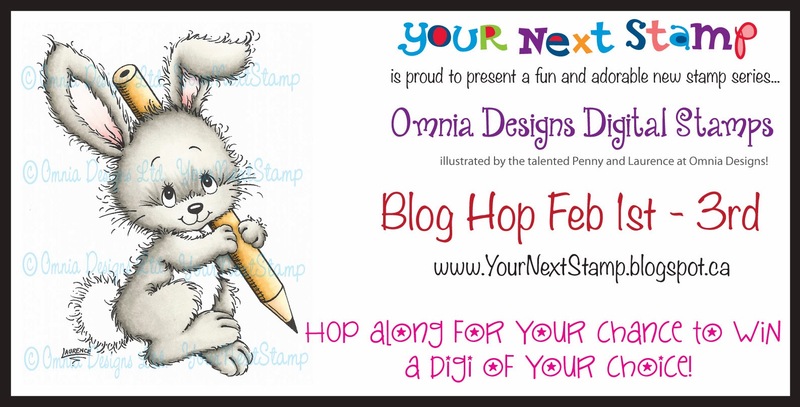 We'll be giving away 6 digi stamps from the stops on the hop, so be sure to leave comments along the way for your chance to WIN!!!!! Winners will be announced on February 4th on the YNS Blog. For my card, I've used Tobi with Pinwheel. 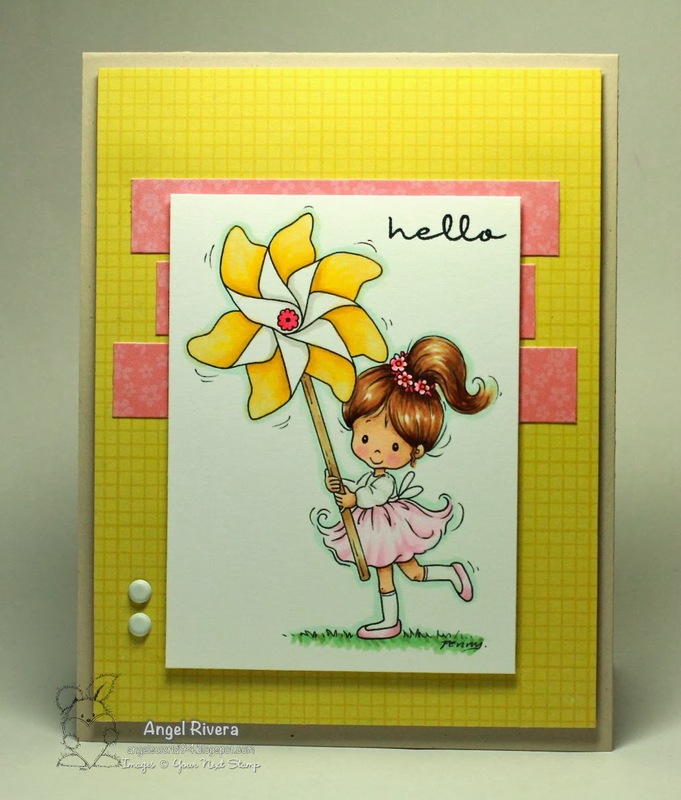 What's not to love about a sweet little girl and a bright yellow pinwheel?! ;) I colored her with copics then went totally Clean And Simple using Karen G's SSSC204 sketch for this week. I popped up the image and yellow dp layers for extra dimension. 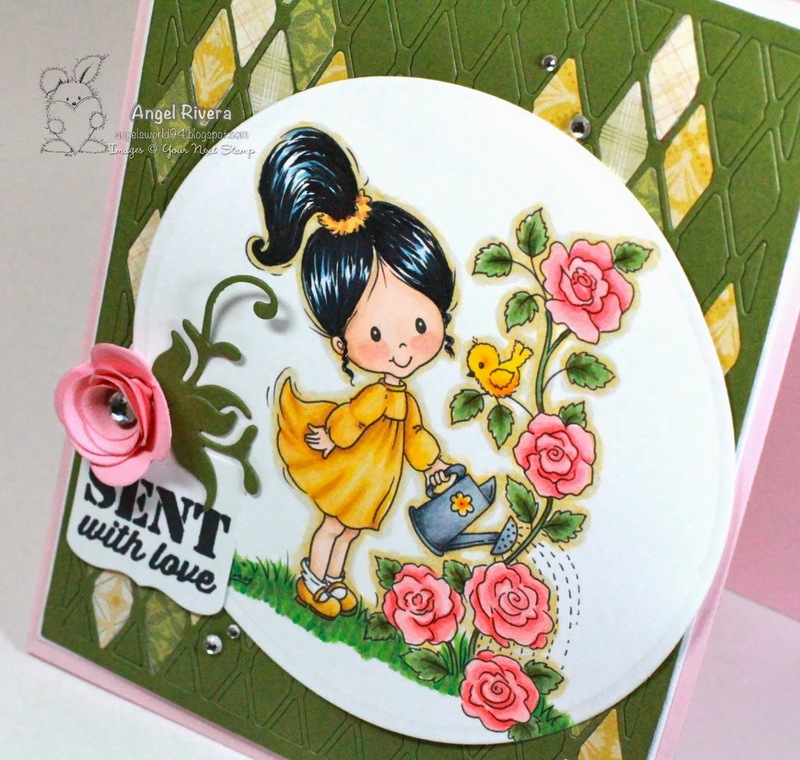 This sentiment from an MFT set was perfect for this cheery card. 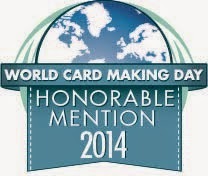 The card base is MFT's natural.